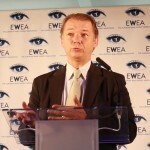 Our sincerest apologies, but as from 2015 the EWEA Blog will no longer be active or maintained. Please visit our news, activities, events or social networks pages to see our latest activities. Comments Off on Where will wind energy be in 2020? With its staunch commitment to wind energy and calls for an ambitious 2030 renewables target, Portugal represented an ideal European location for EWEA to host its annual press trip in 2014. We invited journalists from across Europe to showcase the country’s renewables industry and push home the case for wind energy in member states. EWEA, in partnership with our leading members and the Portuguese national association, planned and coordinated a bespoke and exclusive schedule, giving the nine participating reporters a unique and varied insight into Portugal’s drive for wind energy. Highlights of the trip included a dinner, speech and Q&A with Portugal’s Energy and Environment Minister Jorge Moreira Da Silva; a visit to an EDPR control centre in the heart of Porto; presentations and a tour of an Enercon rotor blade factor in northern Portugal; a dinner and speech from APREN President Antonio Sa Da Costa and, finally, a boat trip to visit Principle Power’s offshore floating wind turbine in the Atlantic Ocean. Throughout the two-day event, journalists enjoyed in-depth and informative discussions with representatives from EWEA’s lead sponsors to ensure they received the full picture of Portugal’s burgeoning renewables industry. This resulted in significant, and above all positive, coverage of Europe’s wind industry in the international press in Demark, Belgium, Spain, Portugal, United Kingdom, Italy and Poland. To date, twenty articles have been published. Comments Off on Donate to charity? Buy lemon pie? What would you do with €2?